The refuge is a hidden gem in plain sight among the rolling grasslands and cotton fields of the Southern Great Plains. The curved mountains of red-gold granite slowly rise up out of the grasslands as you approach them from any direction. I stumbled upon this place in 2016, while searching for training sites for my field crew to conduct avian point counts. When I arrived in late April to train the crew, I was blown away by the refuge’s natural beauty — intact mixed grass prairie bounded by waterways, mature oak woodlands, and wind-eroded granite outcroppings. Although more than half of the refuge is set aside for wildlife conservation, the 22,400 acres that are open to the public provide plenty of opportunities to experience the magic of this place. You could probably hit the highlights in a day, but I recommend camping in the refuge to allow yourself more time to explore the various habitats. Each spring, l look forward to settling in at Doris Campground, being serenaded by Barred Owls, Chuck-will’s-widows, and Wild Turkeys as the sun sets and waking up to the raucous dawn chorus of titmice, gnatcatchers, wrens, and White-eyed Vireos. Wichita Mountains Wildlife Refuge is the oldest managed wildlife facility in the U.S. Fish and Wildlife Service system, protecting 59,000 acres of mountains and prairie. From the intersection of Hwy. 62 and I-44 in Lawton, drive west on 62 for 14 miles. 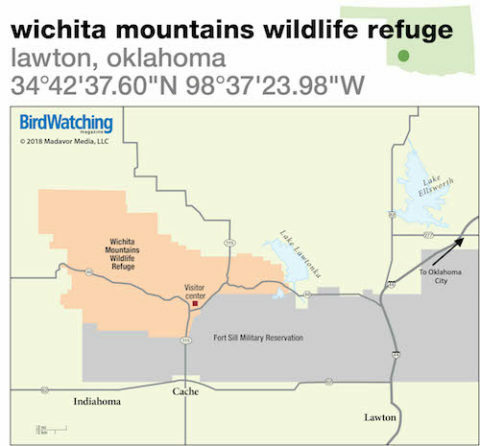 Take exit 115 (for Cache) and continue north for about 4.5 miles to the refuge visitor center. Intact mixed grass prairie, oak woodland, riparian corridors with mature cottonwoods, shrubland, cliff/rock, juniper forest, reservoirs/open water, and wetlands. Varies from flat grassland to steep, rocky trails. More than 250 species. 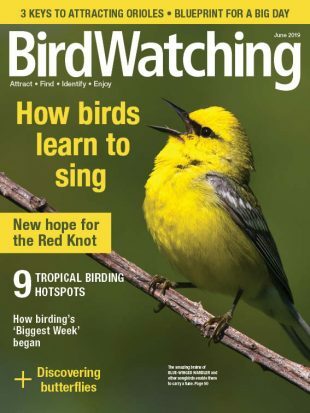 Bullock’s Oriole, Tufted Titmouse, Carolina Chickadee, Carolina, Canyon, and Bewick’s Wrens, White-eyed and Black-capped Vireos, Rufous-crowned, Grasshopper, and Lark Sparrow, as well as 9 other wintering/migrant sparrow species. Brown Thrasher, Barred Owl, Belted Kingfisher, Cattle Egret, both vulture species, Chuck-will’s-widow, Eastern Bluebird, both meadowlark species, Eastern Phoebe, Great Crested and Scissor-tailed Flycatchers, Summer Tanager, Greater Roadrunner, Red-bellied Woodpecker, Red-shouldered Hawk, plus waterfowl, shorebirds, swallows, and woodpeckers. April and May for the greatest diversity of species and the best daily temperatures. Mornings and early evenings best. Visitor center has maps. Restrooms at visitor center and pit toilets at many trailheads. 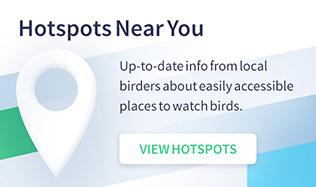 Bird list on website. Camping available on a first-come-first-served basis for $10-$20/night. National wildlife refuge. No entrance fees. Visitor center open 9-5 daily. Main road through the refuge is open to drive through at all hours. To find Black-capped Vireos, listen for their emphatic song in scrub oak and thick juniper either along the Elk Mountain Trail or on the slopes of Little Baldy Peak from March to September. Bring a spotting scope to scan lakes/reservoirs for waterfowl. If planning to spend the whole day at the refuge, bring food and water. A refuge-wide boil order is in effect on all hand pumps due to potential e. coli contamination.